By the time I entered capital markets more than a decade ago, FIX had already become mundane, boring. FIX is essential, but so are eating vegetables, drinking water and exercise. None of those are things I really want to do, and they certainly aren’t worth blogging about. But for the first time in my career, I’m actually excited to talk about FIX. By leveraging the hybrid architecture of TT®, we are putting a modern twist on the boring service of FIX, which we are calling FIX-as-a-service, or FaaS. The challenge in working with FIX is not complexity but management. For both the buy side and the sell side, the challenge is managing many point-to-point connections, each speaking a different FIX dialect, and generally having to do everything manually. While there are some great tools out there for monitoring FIX solutions, and it’s easy to find experienced people to do the work, it nonetheless remains manual, tedious and unexciting. At TT, our new suite of FIX services looks to break the mold and free up our customers to spend their time on more complex and challenging tasks. Put simply, if you are involved in futures, futures options, or cash Treasuries execution workflows via FIX, you can reduce the amount of time and energy you invest in that work by leveraging TT’s FaaS. You will get the most accessible, easy to integrate (no coding required! ), resilient, scalable and fast FIX solution on the market. TT’s FIX administration tools are accessed in a browser from anywhere and any device, and all changes are effective immediately. Want to add a new session? 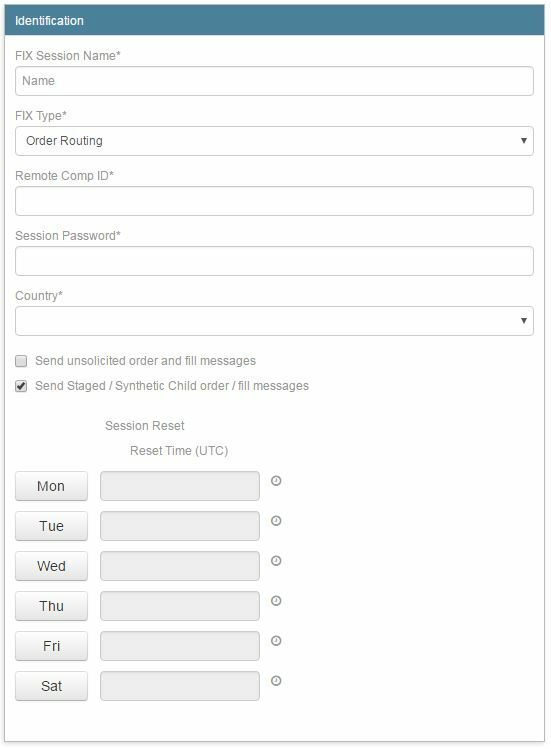 Just open your browser, click “New Session,” fill out a few fields and click “Create”—your session will be up and ready for trading in a matter of seconds. No need to call us. No need to request a session and wait for a maintenance window for it to be active. Need to integrate with TT? Rather than integrating directly with our specification, leverage the power of TT’s FIX Profiles to apply rules and symbol mappings which transform messages on the fly, reducing or even eliminating the need to have software developers involved in a FIX integration. And just like when adding new sessions, there is no waiting for maintenance windows or asking for a service to be restarted. Your rules and mappings take effect instantly on live sessions. In addition to putting the power of real-time FIX integration and administration in your hands, TT also works to provide a more accessible solution for your FIX servers. No need for specific IP addresses. Instead, we’ve deployed FIX servers globally behind load balancers which are discovered via DNS, allowing your servers to connect dynamically to the optimal location. While the solution is still essentially point-to-point, you get the flexibility and accessibility of software-as-a-service. An added benefit of our FIX architecture leveraging DNS and high-availability load balancers rather than static IP addresses is that we can scale the solution without disrupting your business. When we are nearing capacity in our FIX infrastructure, we can scale it horizontally and transparently with additional hardware. TT’s FIX servers store the state of each session in a globally distributed database clustered across every TT data center. This allows for immediate and consistent failover for high availability and disaster recovery. If the TT FIX adapter that your FIX application is connected to were to fail for some reason, you don’t need to fail over on your side to a redundant connection. If you simply reconnect, the load balancer will redirect you to another TT server which picks up all session details including sequence number from the database and continues running. This results in a failover scenario that lasts seconds at the most and does not involve any human intervention on either side. TT deploys FIX servers across every data center globally, so even if an entire data center was taken down in a disaster scenario, the same design that makes failover immediate will ensure that FIX sessions can fail across regions just as efficiently. The beauty of the TT platform’s architecture is that it has allowed us to bring all the benefits of software-as-a-service to a professional trading platform without sacrificing performance. In the context of FIX, this means that we have made significant investments in co-location, hardware acceleration and optimizations across all software components to ensure we are providing the fastest solution in the market. Today, our end-to-end latency from receipt of a FIX message to it leaving for the exchange (including all risk checks which are part of the OMS) has a median latency of 55 microseconds. We will be continuing to invest in further reducing those numbers. Not only does TT’s FIX solution provide fast execution of vanilla order flow, we’ve also exposed the industry’s fastest autospreader to all FIX clients in addition to our Aggregator (a/k/a smart order router) and all TT synthetic order types. Lastly, because our FIX solution is fully integrated with all the other capabilities of the TT platform, you can even build your own execution algos and then leverage them via FIX. For the sell side, this means being able to leverage TT for execution algo development and distribution not only for users of TT screens but for all your customers regardless of what front end they choose. For a buy-side firm that leverages many different vended systems for execution and order management, this means you can use TT as an algo development platform which can then offer up those custom algos to every other system in your suite of tools. In conclusion, FIX-as-a-service is only part of the story. The market coverage and “elasticity” of the TT global network combined with FaaS completes a broader story. Market access requirements are always evolving (for the buy side and sell side) and the TT global FIX network is always available “on demand.” Market access built on traditional technologies requires investment in hardware, infrastructure and telco with multi-year commitments, but building on top of FaaS to offer Market-Access-as-a-Service is yet another way TT is revolutionizing how traders access markets. Check out our new overview of FIX on TT here and contact us to learn more about the details of how TT’s new FIX services can empower your business.